Welcome back for another Pawsome Pet of the Week! Our featured pet this week is one big guy, but he's what you'd call a "gentle giant". 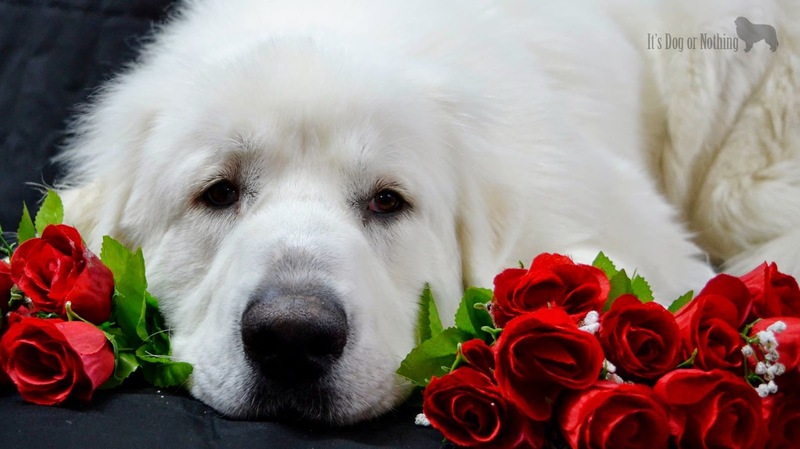 His name is Atka and he is a one year old Great Pyrenees. He was born in Virgina, but now resides in Montana with his family. He is a Canine Good Citizen and is currently working on becoming a therapy dog too. One of Atka's amazing special abilities is that he is apparently able to produce drool-strings over a foot in length. He describes this ability as "impressive" and I'd have to agree with that! "I tirelessly guard my humans day and night. There isn’t a squirrel or leaf that gets past me! Plus, when my people need a snuggle I’m at their side." I'm sure his humans appreciate all of Atka's hard work and the effort he puts into guarding them to make sure they stay safe. And speaking of keeping his human's safe, Atka shared a story with me about how he once saved their life from a giant, floating, noise machine. "Last summer I went with my humans to visit my grandparents at their lake house. We were having a great time relaxing on the dock, until my humans decided to get in this giant, floating, noise machine. The machine started pulling away from the dock and I panicked! I was so worried about them that I jumped into the water to save them. I was chasing after the machine while my gramma shrieked from the dock. She must have been so worried about my humans so I swam harder. After I made it halfway across the lake (dad says it was about 50-75 yards) the machine turned around and I got my humans safely back on the deck. Phew." It's obvious that Atka is one brave dog! He also loves water, which is apparently an uncharacteristic trait for his breed. Swimming is his favorite activity. 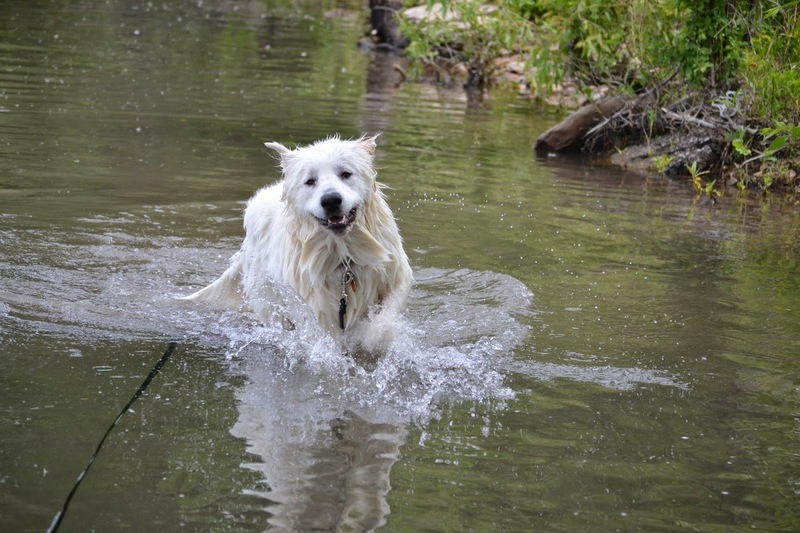 "My mom says I must be part newfie because pyrs don’t typically like to swim. Get me near water and I’ll be the first one in! I’ve gotten in trouble a few times when mom called me and I looked at her, turned around, and hopped back in the water. Since we live in Montana and I don’t get to swim often, I’m happiest playing with my yellow, squeaky ball. I’ll chase that ball around the yard all day!" Atka's favorite treats are bully sticks and he gets one every night before bedtime. I also wanted to know what Atka's favorite thing about himself was, so I asked! "Well, my tail is pretty cool. I’m keep trying to get it, but it seems like it’s always out of reach!" Maybe one day you'll catch that sneaky tail Atka! 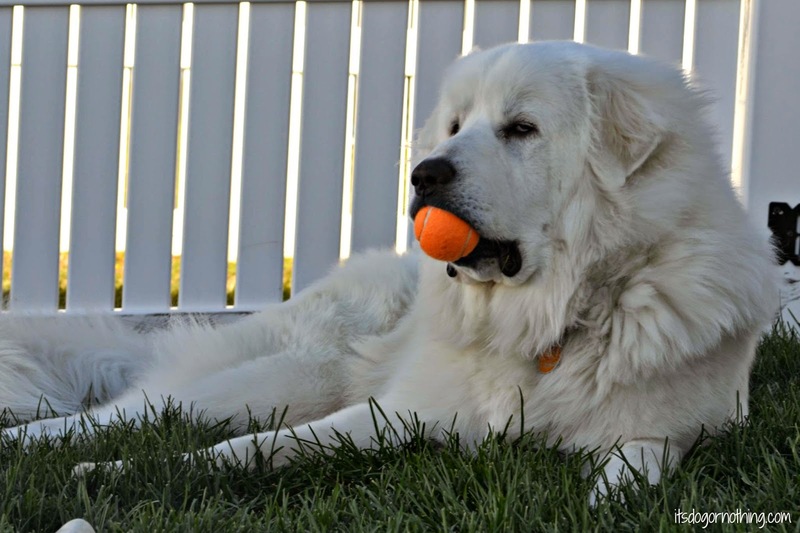 Until then, you can find Atka (along with his sister Mauja) at his very own blog called It's Dog or Nothing. He's also on Facebook, Twitter and Instagram. Be sure to stop by and say hello! And stop by next Friday for another Pawsome Pet of the Week! We must go check it out. Have a fabulous Friday. You are one awesome pup! Pyrs don't usually like water. Katie doesn't like water at all, heavens, she isn't even real keen on drinking it! Atka is one pawesome pup, indeed! Happy Friday, Miss Ann! I just love Atka and his sister Mauja! I can't wait to give them big hugs at BlogPaws this year! I want a big fluffy dog some day, so for now I enjoy the fluffiness through their blog! Heyyyyyyy, I know that gorgeous pup!!!! We love Atka and Mauja, the big fluffies!! So adorable!! Oh my goodness, handsome, handsome, handsome! Such a beautiful dog. I enjoy reading about him and his sister, thanks for more information about him. What a big sweetie, and doesn't he look gorgeous with those red roses!